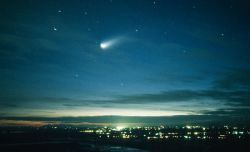 [frame_right] [/frame_right]Comet ISON is predicted to be 15x the brightness of a Full Moon, visible during daylight. It will make a close approach to the Sun Nov 28, 2013; perhaps breaking up as it passes within roughly 1 million miles. It’s near parabolic orbit leads astronomers to believe this is its 1st approach to the Sun. ISON is an Anglo-Saxon, Norman French, Old English derivation of “Joseph” meaning “Adding or Increasing”. “And the third angel sounded, and there fell a great star from heaven, burning as it were a lamp…” Rev 8:10 Comet means “Long Haired Star”. Whether this “Star” is the prophesied “Wormwood” of Rev 8:11 remains to be seen, but the timing is worth being aware of. Dan 8:14 spells out 2300 days from Daily Sacrifice to Cleansing of the Sanctuary. 1260 days, 42 months of 30 days of “Great Tribulation” begins with the Sticks Joseph-Ephraim and Judah (Eze 37:16), the Temple Altar and Court of Gentiles (Rev 11:1), the Beasts of the Sea and Earth (Rev 13) and the “Transgression of Desolation” (Dan 8:13). These are all describing the same event from different perspectives. The 5th Trumpet at Rev 9:11 is clearly spelled out as 5 months (150 days); the 6th Trumpet is 13 months +1 day +1 hour (391 days) for a total of 541 days. 1260 – 541=720 days or 2 years. The 1st 4 Trumpet warnings fit in these 2 years. ; arguably one of the more visible events will be the fall of the Star burning as a lamp “Wormwood” at or near the middle of this 2 year period. ISON is a “Sign in the Heavens” that to my knowledge, astronomers just became aware of; no Comet that bright has ever been recorded in history from what I know. There are also 7 other “Signs in the Heavens” that need to be factored in that have been known for 4300 years. The Sun will rise througn the X formed by the Ecliptic and Zodiac forming the Chi-Rho symbol on 12/21/2012. 4 consecutive Lunar Eclipses will occur Passover and Tabernacles: April 15, 2014, Oct 8, 2014, April 4, 2015, Sept 28, 2015. 2 Solar Eclipses will occur on God’s New Year Mar 20, 2015 coincident with Iranian “Nowruz” (New Light) and the Rabbinical New Year “Rosh Hashanah” aka “Trumpets” Sept 13, 2015. Compare these “Signs” God set up with the Flood with Is 13:10-13 “The stars of heaven and the constellations thereof shall not give their light: the sun shall be darkened in his going forth, and the moon shall not cause her light to shine. And I will punish the world for their evil, and the wicked for their iniquity; and I will cause the arrogance of the proud to cease, and will lay low the haughtiness of the terrible. I will make a man more precious than fine gold; even a man that the golden wedge of Ophir”. Therefore I will shake the heavens and the earth shall remove our of her place, in the wrath of the LORD of hosts, and in the day of his fierce anger”. My guess is the “Wedge of Ophir” is the leverage Gold, Fiat Currency, Usury and Derivative based money has created; this was first done by the Phoenicians in the rein of Solomon and continued by Knights Templar. Ophir represents acquiring and hoarding Gold wherever it is in the world. A lot of “Signs” are coming up shortly, the first being the Cross of Constantine on 12/21/2012. Rev 6:14 “Heaven departed as a Scroll when it is rolled together” comes before ISON, and after the start of Great Tribulation. Do not wait for a “Sign from Heaven” to accept Jesus Christ as your personal Lord and Saviour. I suggest doing that now. Did you do it? Come on 2 minutes in a Prayer Closet is not that hard is it? I can tell you from personal experience, when I gave up, repented for Sin and asked the LORD for help, it came immediately and there was no doubt as to the source! I’m sure you noticed ISON is a bit like SION! Don’t wait for that event!